In 1822, the first land purchase by the Washburn family in Jefferson County occurred between Dyer Washburn, born 1790 in Connecticut, and his in-laws Samuel and Catherine Bass of Northampton, Montgomery Co., New York. The property consisted of 100 acres of unimproved land with no dwellings, situated on Old Salt Point Road, between Sulpher Springs Road and the Town of Adams line, in the neighborhood known as Camp's Mills. About 1825, Dyer's two brothers, Schuyler, age 25 and Robert, age 24, removed themselves to Hounsfield, leaving behind their parents in Schoharie County. Together they set about clearing the lots and erecting homes. The first house to be built was on the east side of the road and was accompanied by a barn. As family members grew of age, they erected more homes in its vicinity. Land ownership maps from 1855 indicate that Dyer Washburn owned the main house in that year and Robert owned a house no longer standing on the west side of the street. When land ownership maps were again made in 1864, they had traded homes permanently. The door of the house used to contain a chime which would play a pleasant melody whenever the knob or a key was turned. 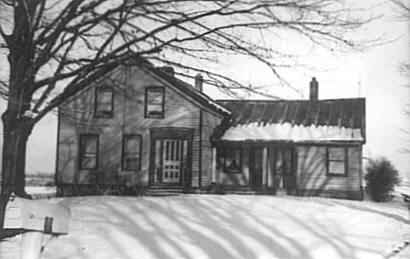 Inside, the home had six bedrooms and a root cellar. The most spectacular room was the parlor which was guarded by solid wood double sliding doors. In this room the family spent most of its time. All the Washburn children in this line of descent were born there until 1916. When a family member died, they were laid out in the parlor and the funeral services were conducted there in the home with the whole family present. This was the family way until 1972. The Washburns depended on one another for their livelihood. For over 150 years, it was typical for successive generations to live and die at the homestead, having stayed there all their lives to assist their parents with the farming. Robert Washburn died in 1874, but handed management of the homefarm some years prior, for in Child's 1864 Business Directory of Hounsfield is listed "Washburn, Silas R., (Sackett's Harbor) r 66, 13 cows, 150 sugar trees, farmer 90" which indicated that Silas was primary operator of the farm, and participated in the dairy trade and in maple sugar production. In 1911, Silas died, leaving the homefarm to the care of his eldest son, William Wallace Washburn, age 34. He worked the farm for over 75 years before dying in May 1952. He left behind a widow, Ada (Stokes) Washburn, three daughters, Mrs. Beulah Jenkins of Camp's Mills, Mrs. Margery Gordonier of Adams, Mrs. Esther Fee of Adams, and one son Leon Silas Washburn. Leon remained on the home farm and took care of his mother until her death in 1972. In 1973, Beulah's daughter Ann and her new husband stayed at the home briefly after their marriage, adding a fifth generation of Washburn descendants to the home's history. Not long after, the siblings sold the property to a family friend. The new owners renovated the downstairs, but the upstairs has been left in the condition the Washburns kept it. The owners graciously welcome visits from those who still hold fond memories of times spent on the farm with family. 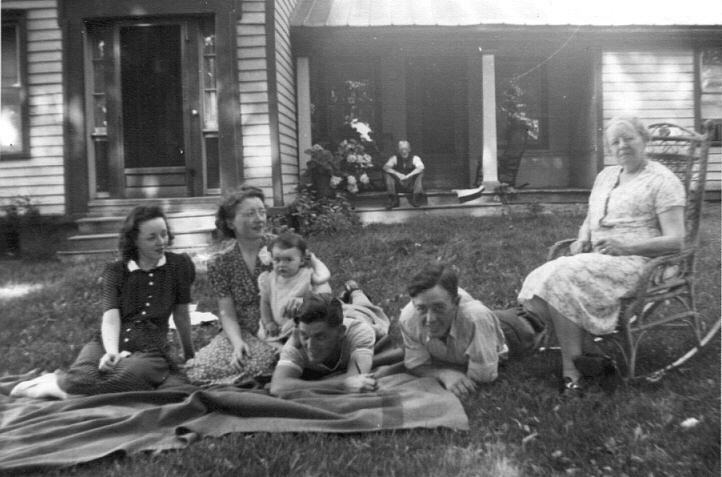 Beulah Washburn, Marjorie Washburn with daughter, Don Gordinier, Leon Silas Washburn, Ada (Stokes) Washburn in chair, William W. Washburn on porch.